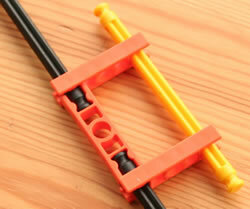 It is sometimes necessary to create a K'NEX "rod" that is longer than the 190mm rod. For instance, to drive a large fairground model from a motor, via a long axle. This can be achieved by "locking" two or more rods end to end, as shown in the photo.